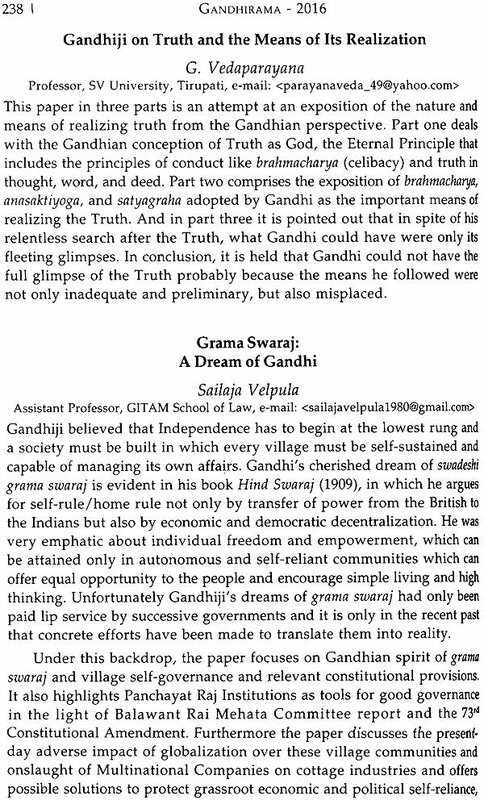 These selections (of Gandhiji's writings), titled Gram Swaraj, have been sourced from the book Village Swaraj, compiled by H.M. Vyas, and first published by Navajivan Publishing House, Ahmedabad, in 1962. Chapters 1-3 of Village Swaraj being introductory in nature and chapters 7-13 being only more detailed versions of the "Basic Principles of Village Swaraj" have been left out. Thus, in place of 29 chapters in Village Swaraj, the collection under Gram Swaraj has 19 chapters and all essential subjects have been duly covered. In Gram Swaraj, chapter 1, "Cities and Villages", introduces the basic argument of Gandhiji, that even though bulk of India's population (then 85-90 per cent) lived in its 7,00,000 villages - and according to 2011 data, nearly 70 per cent Indians (833 million out of total population of 1.2 billion) still live in its 6,00,000 villages - rural India was much more impoverished, backward and exploited as compared with urban India. Chapter 2 deals with the broad concept of "Village Swaraj" including the subject of "The Place of Villages" and the need for Ideal Villages" as exemplars. 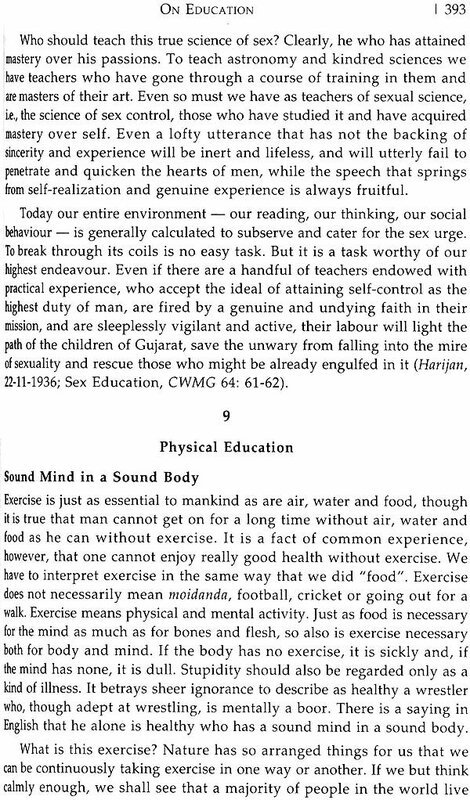 Chapter 3, then covers "Basic Principles of Village Swaraj" under twelve subtitles, including very important subjects such as, employment, equality, "Trusteeship", decentralization, swadeshi, self- sufficiency, communal harmony, Panchayat Raj, and Nai Talim (Gandhiji's charter of "free and compulsory education" for every child up to the age of 14). 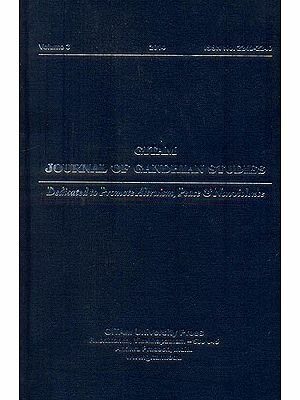 Chapters 4 to 8, titled" Agriculture and Cattle Welfare" cover a wide range of subjects related to rural economy, such as the condition of "Kisans", problems related to landownership such as those between landlords and tenants, cooperatives for working cattle and land, scientific treatment of agricultural and other rural wastes and their conversion into valuable compost/manure, and how to deal with the persistent problem of food scarcity. Chapter 9 covers Gandhiji's well-known programme of "Khadi and Spinning" for the revival of village, as also national economy. Chapter 10 deals with his pursuit of a wide range of "Other Village Industries", such as, pounding/ grinding of rice and corn, ghani oil, gur and khandsari, bee-keeping, tanning, soap-making, hand-made paper, and arranging village exhibitions. Chapter 11 covers the allied subject of "village transport", primarily animal carts at that time. Chapter 12 covers the broader subject of "Currency, Exchange and Tax" as relevant here. Chapters 13, 14, and 15 cover the interrelated subjects of "Village Sanitation", "Village Health and Hygiene", and "Diet" respectively. 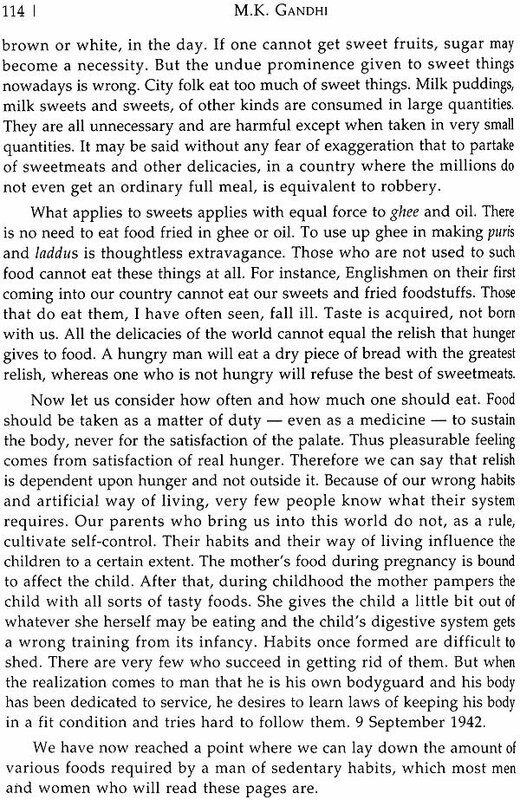 Gandhiji's deep and abiding interest in sanitation and health matters is well known but it is generally not known that, based on his studies and experience, he had also written articles/booklets titled "General Knowledge About Health" (from part [-I] dated Indian Opinion, 4.1.1913, to the last part [-XXXIV] dated Indian Opinion, 16.8.1913; CWMG 11 & 12), and then "Key to Health" (18.12.1942) (CWMG 77). 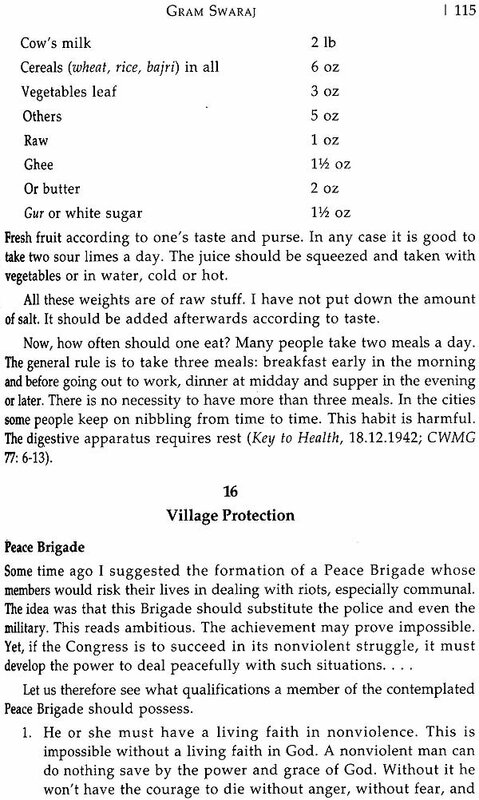 Chapter 16 covers the subject of "Village Protection", including Gandhiji's very original ideas about "Peace Brigade", "Police Force", and "Nonviolent Volunteer Corps". Chapter 17, "The Village Worker", gives detailed coverage to Gandhiji's persistent efforts so that selfless and devoted "village workers/volunteers" came forward to pull the Indian villages from the morass and exploitation, which then, and now as well, characterize the life in villages. Chapter 18 briefly relates to "What the Government Can Do", including what the elected ministers should do. The last chapter, "India and the World" concludes the selection with a reminder about what swaraj means and how a just and equitable treatment of all Indians including those in villages, alone can let India become an example of a non-exploitative social order for the world. "It is Swaraj when we learn to rule ourselves .... But such swaraj has to be experienced, by each one for himself" (Hind Swaraj, CWMG 10: 39). "Swaraj is freedom for everyone, the smallest among us, to do as he likes without any physical interference with his liberty" [Young India (24.11.1921); CWMG 21: 485]. "To me it has but one meaning: the eradication of the poverty of India and freedom for every man and woman. Ask the starving men and women of India. 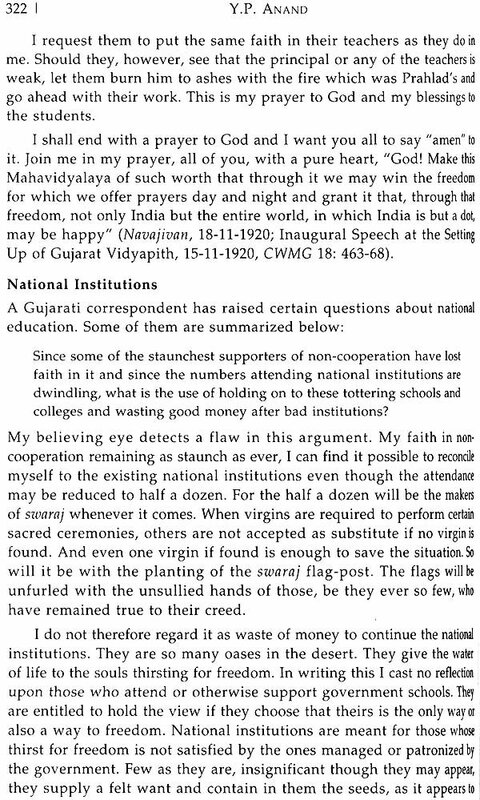 They say that their swaraj is their bread .... Swaraj should mean this, too, that we become self-supporting" [Hindi Navajivan (4.5.1924); CWMG 23: 538]. 1. [T]he swaraj of my dream is the poor man's swaraj. The necessaries of life should be enjoyed by you in common with those enjoyed by the princes and moneyed men" (11.3.1931; CWMG 45: 280). 3. Independence should be ushered in with the greatest good grace which the poorest villager in the remotest village can at once realize" (Letter to Lord Wavell, 6.4.1946; CWMG 83: 371). 4.Independence must begin at the bottom. Thus, every village will be a republic or panchayat having full powers. It follows, therefore, that every village has to be self-sustained and capable of managing its affairs even to the extent of defending itself against the whole world .... In this structure composed of innumerable villages, there will be ever-widening, never-ascending circles. Life will not be a pyramid with the apex sustained by the bottom. But it will be an oceanic circle whose centre will be the individual always ready to perish for the village, the latter ready to perish for the circle of villages, till at last the whole becomes one life ... no one is to be the first and none the last" [Independence, Harijan (28.7.1946); CWMG 85: 32-33]. 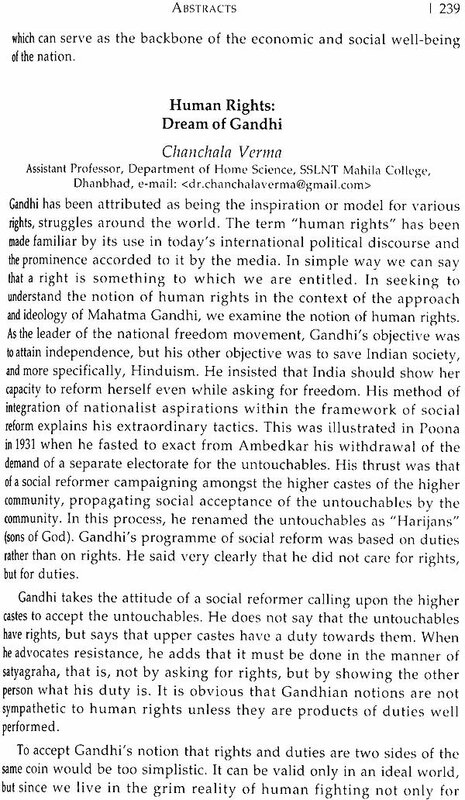 Brief comments related to the subjects covered under chapters 1 to 19 of Gram Swaraj are as follows. 1.Is India living in her 10 or 20 cities, or is she living in her 700,000 villages? What then is the programme that can weld together the 30 crores of people ... in 700,000 villages? The one and unequivocal answer is the spinning-wheel and khaddar .... The spinning-wheel can be turned by millions of the villagers of India who have been reduced to pauperism, who have been ground down to dust, not merely under the foreigner's heels but under your heels, under my heels. 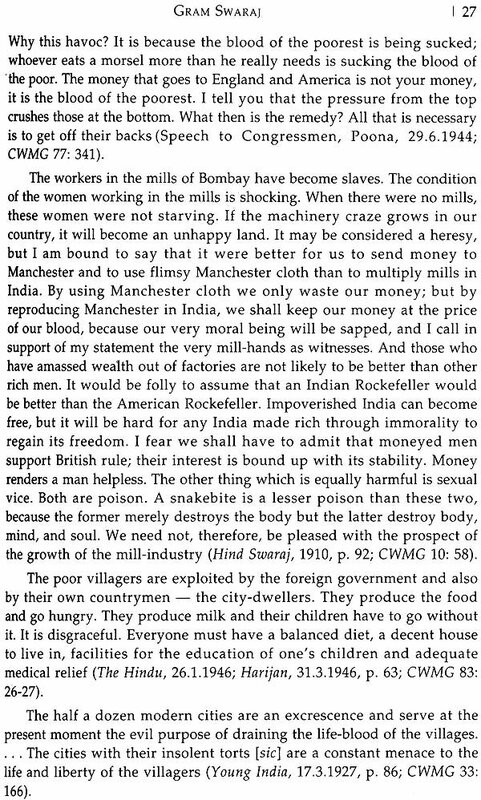 We the city-dwellers are living upon the labour, upon the wealth of these millions of villagers; " [Young India (13.1.1927); CWMG 32: 508-09]. 2. 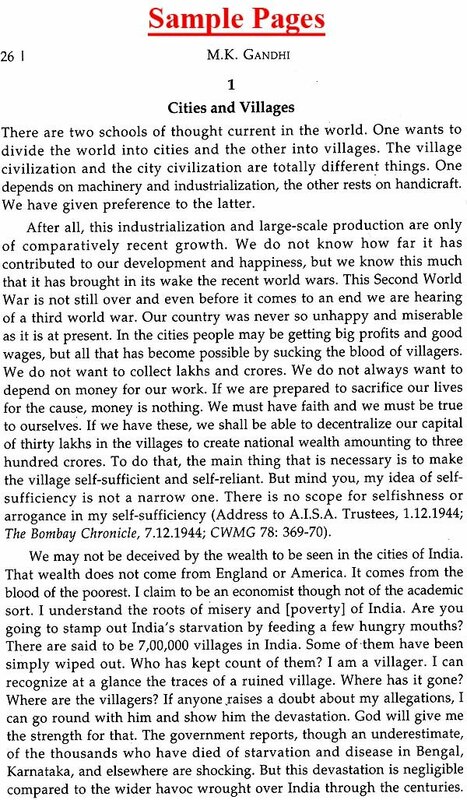 In a speech at Bombay (18.4.1931), he told how the cities should develop in harmony with the villages: "India does not live in its towns but in its villages. But if the cities want to demonstrate that their populations will live for the villagers of India the bulk of their resources should be spent .in ameliorating the condition of and befriending the poor. We must not lord it over them, we must learn to be their servants. 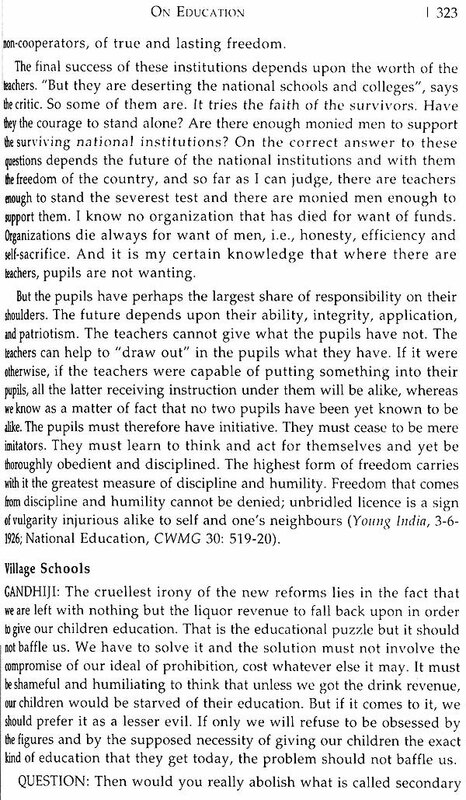 When the cities realize that they must live for the welfare of the poor, they will make their palaces and institutions and the life of their inhabitants correspond somewhat to our villages ” [Young India (23.4.1931); CWMG 46: 12]. 1. I would say that if the village perishes, India will perish too. It will be no more India. Her own mission in the world will get lost. The revival of the village is possible only when it is no more exploited" [Harijan (29.8.1936); CWMG 63: 241]. 2. India lives in her seven lakhs of villages - obscure, tiny, out- of-the-way villages .... That is real India, my India, for which I live" (24.3.1946; CWMG 83: 315). 3	Just as the universe is contained in the self, so is India contained in the villages" (12.7.1945; CWMG 80: 438). 4.If India lives in the villages, then let there be but one ideal village and it can serve as a model for the whole country" (13.7.1945; CWMG 80: 438). After his return to India in 1915, Gandhiji had consistently kept studying and working on the economic, political, social, and any other issues relevant to the uplifting of the life in ifs villages. He had worked in the villages in Champaran (1917) and then continued thus onwards such as in Kheda, in Wardha and Sevagram, and even while involved in dealing with the communal violence in Bengal and Bihar during 1946-47. He had, therefore, a deep understanding of the problems and their solutions concerning villages in India, or how to bring swaraj to the villages. He had initiated the concept of "Constructive Programme" as a concomitant of the freedom movement itself, and finally it included 18 items. While items such as "Khadi" and "Other Village Industries", "Village Sanitation" and "Education in Health and Hygiene", and "Kisans" were related only to the villages, all remaining items too were equally applicable for the villages. Sir Henry Maine had left a work on Village Communities ... had shown ... that the Indian village life had so much vitality and character that it had persisted all these long years .... He had described these villages as so many village republics completely self-contained, having all that one may want - schools, arbitration boards, sanitation boards, and ... provision for relief of the poor. He had also shown the treasures of art that the genius of the Indian villager had produced. The villager then learnt from his parents by word of mouth all the wisdom .... In daily contact with people, he was able to realize the value and possibility of personality." The whole village life was broken. People were dying by millions of ... diseases, all brought about by insanitation, deep poverty, sloth and idleness .... One might search the records of the East India Company to see ... how ruthlessly the village system was broken. . . how injustice, bribery and corruption reigned ... the handicrafts of India were ruined. Any young man who has a character to save venture out to the villages . . . . But he will have to be patient and truthful. ... There is a Trinity of Evil - insanitation, poverty and idleness ... you will fight them with broomsticks, quinine and castor oil and, if you will believe me, with the spinning wheel [25.8.1925, Young India (17.9.1925); CWMG 28: 108-09]. Our country was never so unhappy and miserable as it is at present. In the cities people may be getting big profits and good wages, but all that has become possible by sucking the blood of villagers .... We must have faith and we must be true to ourselves ... the main thing necessary is to make the village self-sufficient and self-reliant. ... I am not preaching isolation .... Though the villagers will be self-sufficient so far as it is possible, they will devote their time also to their intellectual development for the creation of the consciousness for he contemplated nonviolent society of the future .... When seven lakhs of villages will take up this work in the new spirit we shall not remain a subject nation. Each one of our villages will be independent and self-reliant. That is true swaraj and that is true democracy (1.12.1944; CWMG 78: 369-71).